As the only short and well-visualised work on Adolf Hitler’s life from beginning to end, this book is like no other. Unlike the majority detailed works by other historians, Armin Fuhrer addresses (younger) people with an interest in history who may not be so familiar with the subject. 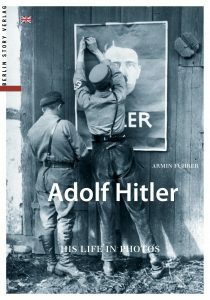 Over 96 pages with more than 200 images, his photo-biography provides a critical overview of Hitler’s political career and the history of the “Third Reich”. Historian and journalist Armin Fuhrer draws on international research. There is no question today that the “Third Reich” would not have existed without Adolf Hitler. The central question “How could it happen?” can only be answered by looking at Hitler’s biography. Together with the Berlin Story Publishing House, Fuhrer delved into the National Archives in Washington to find rarely before seen photos.